Prolific fruiting, incredibly winter hardy and very easy to grow. Decorative as well as bountiful, either will look wonderful when trained over a pergola and will provide natural summer shade. Collection includes 'Moscatel' and 'Red Globe' - sweet, tasty, juicy white and red dessert (eating) grapes. Perfect in a pot on your patio or in the ground - train up terraces and pergolas. Delivered as a pair of 120-140cm caned vines in 5L pots - ready for immediate planting. You don’t need a Tuscan garden bathed in Mediterranean sunshine to be able to grow your own delicious grapes - just give them a warm, sheltered spot and you'll be filling your fruit bowl! Simply irresistible! Imagine starting your day with a delicious, refreshing, health-packed glass of grape juice or a handful of fresh, sweet grapes picked straight from your own vine sprinkled on your cereal! Simply Gorgeous! Prolific fruiting, incredibly winter hardy and very easy to grow. Decorative as well as bountiful, either will look wonderful when trained over a pergola and will provide natural summer shade. 'Red Globe' is a great dessert (eating) grape, seedless and extra large, very sweet fruit. It can be grown outside in milder regions though is best suited to growing in a cool greenhouse or conservatory. Delivered as a pair of 120-140cm caned vines in 5L pots. Ready for immediate planting. 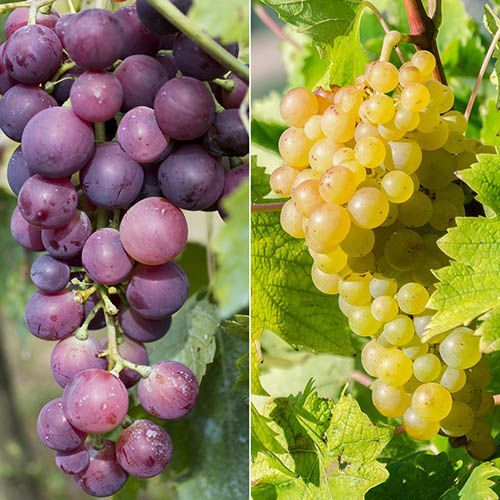 Before planting, select a site with full sun or at least morning sun - light shade in the afternoon is fine - and ensure that a support is in place for the grapevine to grow up. Dig over your planting site thoroughly and incorporate some well rotted compost, removing all weeds. For each vine, dig a planting hole 12 inches deep and 12 inches wide. Fill with 4 inches of topsoil and set the vine into the hole slightly deeper than it grew in the nursery. Cover the roots with 6 inches of soil and firm down well. Fill with the remaining soil, but leave it loose. Prune the top back to two or three buds and water in well. In the first couple of years, your vine should not be allowed to fruit so that it can strengthen its root system and produce better crops in the coming years. Prune annually in late November-December and don’t be afraid to remove up to 90% of the previous season’s growth - the more you prune, the more grapes you will have. Do not feed in the first year anad feed lightly in the second year of growth. Mulch well in winter to retain moisture, and you may wish to use netting to keep birds away from the grapes as they grow.